Montebello, Calif. (MuseWire) – Tascam this week announced a line-up of holiday rebate promotions on their line of audio/recording gear. 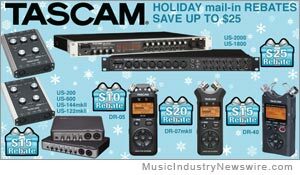 TASCAM’s Holiday mail-in Rebates include: DR-05: ($10), DR-07mkII: ($20), DR-40: ($15), US-2000, US-1800: ($25), US-600, US-200, US-144mkII, US-122mkII ($15). Offer is only for applicable products purchased between 11/15/11 and 12/31/11. Submissions must be postmarked by 1/15/2012 to qualify. Rebate will end on December 31. Download rebate form at (PDF): http://tascam.com/content/misc/universal/rebatewebform2011final.pdf .